Davis certainly isn’t taking the blame for this. He’s putting this squarely on Reggie McKenzie. The 2014 draft produced Khalil Mack (traded), Derek Carr, and Gabe Jackson. Carr and Jackson are starters and the Raiders inexplicably traded All Pro pass rush, Mack. Justin Ellis went on the IR with a foot injury but could come back. Other players from that draft are contributing. TJ Carrie is a starter in Cleveland. Shelby Harris is getting time in Denver. The Raiders last pick of the 2014 draft was Jonathan Dowling. He plays in the CFL. But, take a look at what this draft is doing in the league and you wonder why is Davis’ beef? Lets be honest. When Jon Gruden was brought back to the mother-ship, the clock on McKenzie’s employment status started clicking. When Gruden awarded a ten year contract, McKenzie was essentially dead man walking. The idea that Davis and Gruden are trying to sell the Mack and Amari Cooper trade is some sort of by-product of McKenzie is ludicrous. Heck, who knows if McKenzie was even in the room when the decision was made. He might’ve been getting out of his car and had some intern say “you traded Khalil Mack today”. This leads us to the real reason Davis took the “blame”. The problem isn’t McKenzie. The problem might not even be Jon Gruden and his awful roster decisions. The biggest problem is Gruden’s contract. 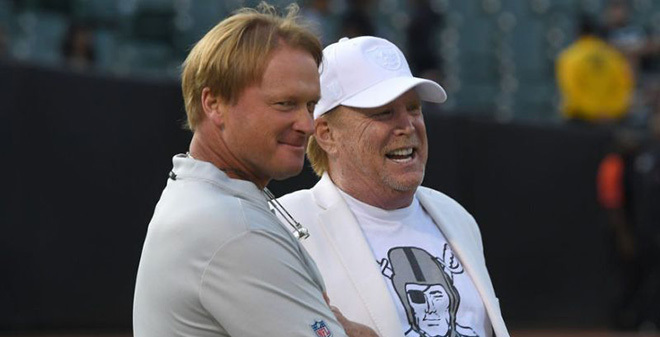 A contract that Mark Davis is 100% responsible for. Attack his haircut. Attack his limited attire. Attack everything and Davis will live with it as long is it distracts from his most damning mistake. This mistake could set the organization back further than drafting 1st round bust, JaMarcus Russell. It could be the worst decision this organization made since… well there’s just too many examples. But you get the point. Davis is willing to grandstand and throw himself on the mercy of the fans. In fact, he doubled down on his distraction tactic by saying he wanted to stay another season in Oakland as if the city appreciates his lousy product. The only thing worse is the Coliseum itself. Giving anyone total control in the NFL is nuts. Giving it to a guy who had been out of the league is 10 levels above nuts. That’s what Davis did. He channeled the later years of his Dad and made a debilitating decision. At least Al made mistakes trying his hardest to bring in more talent. His son is bringing in a coach who won a Super Bowl with another coach’s players. A coach who mismanaged the clock in the “Tuck Rule” game. A coach who thought Bobby Hoying was an adequate back up. Yeah… that guy.